Adventurers! We nee your help! You and your adventuring companions are just returning to the bustling city of Greyport after your latest adventure. You are all looking forward to relaxing and spending some of your hard-earned loot at The Red Dragon Inn. The party will have to wait, though, because the city is under attack by evil monsters. 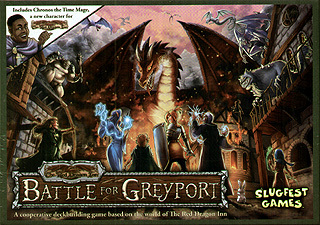 Battle for Greyport is a cooperative deck building game based on the characters and world of The Red Dragon Inn. You will travel to important locations around the city, fighting epic battles and recruiting whatever heroes and items you can along the way. Each encounter presents more opportunities to improve your deck, but also brings more dire foes for you to face. With five playable characters, seven different scenarios, and an assortment of variants, you can have a new game every time, adjusting the game's difficulty as you improve. Will you defend the city from the monsters and defeat their nefarious boss, or will the city (and the tavern) be overrun? Includes Chronos the Time Mage, a new character deck for The Red Dragon Inn. Also includes the promo drink card Drog's Special Reserve!